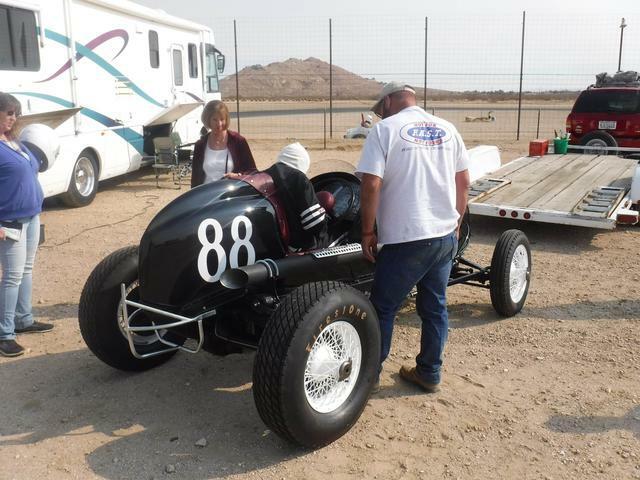 ​The 88 Black Sprint car was built in San Francisco by Bob Scovill as a three springer. Fred Agabasian drove it in 1937 in its first iteration. After WWII, it was modernized at Louie Vermeil’s garage in Calistoga with a cross spring front, a bull nose and a headrest. Wheels were updated to 16” Dayton Speedway wires. It ran in this configuration through 1954 season with a 4-port Riley on a “B” base for power, winning the ARA Championship in 1951 and 1952 with Jack Flaherty driving. It sat in the Alexander Valley barn of the owner Ed Sheerer (through the 1955 Russian River Flood that left watermarks just below the hubs) until my partner Rick Arata and I purchased it in 1966. We ran it with NARC in 1968 and 1969, powered be a 283 Chevrolet V-8. In the 80’s, Rick and I started working on restoring it to post war configuration. After Rick died in 2009, his sons, Jeff & Anthony, who run a modern midget with BCRA, became my partners and are helping get the car completed by the end of August, to appear at the Calistoga Speedway Hall of Fame dinner. Current Engine is a 208 Ford Model B with a SOHV Ray McDowell head that was resurrected from the dead by Stan Vermeil at his VEO shop in Nevada City, Ca. this head was in the Bill Razor sprint car driven by Ted Horn in So. Ca. in 1937 I believe. 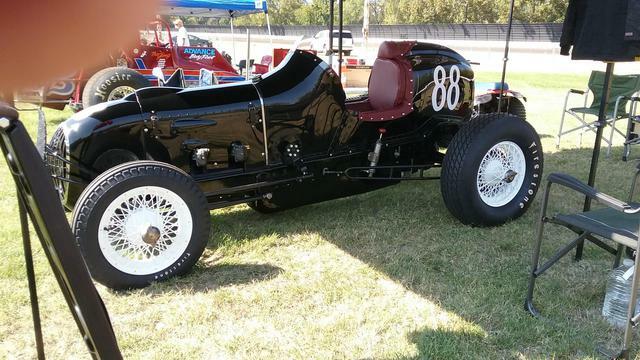 I went to the races at Calistoga over Labor Day, I met Tommy Rand of Lake County, whose grandfather Joe Rand owned (and mostly drove) this car from about 1940 to 1950, and was responsible for the update in 1947. Tommy lost his home in the big fire last year; he said he saved three things: his cat, his dog, and his tub of memorabilia from his grandad, including a meticulous journal of earnings and expenses, and some photos. From these I learned that Ed Elisian had driven this car on a couple of occasions in 1947. I had already known (and have photographic evidence) that Freddy Agabasian drove it at Oakland Speedway in 1937. Two Indy drivers have raced this machine! 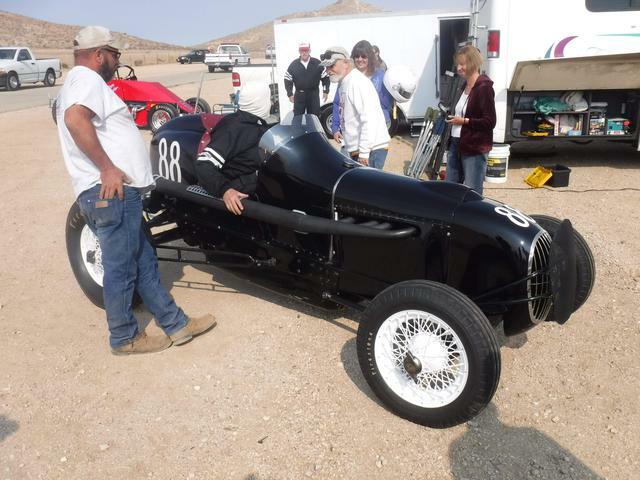 The car is currently owned by Bill Crowley and the Arata family of Storck's Garage, a 98-year old Napa auto repair business that currently runs a midget with BCRA. The car in it's first iteration, taken at Oakland Speedway in 1937, with Freddy Agabasian. This is the car in the last year of it's competitive era, taken in downtown Healdsburg, CA, in 1954, with then-owner Ed Scheerer, who never drove the car, seated in the cockpit. And in May, 1969, our final season with this then 39 year-old car.